This snack is delicious and very easy to make. Just keep any filling of your choice ready and assemble it when your guests arrive. Making the papad cones is very easy. Cut the papads into halves, brush some oil on both sides and microwave them for half a minute on each side. Immediately roll them into a conical shape. You can do it on a tawa also. But the rolling has to be done within seconds after removing from tawa or microwave before the papad turns crispy. This was for " Shhhhh Cooking Secretly Challenge" I was paired with Shobana Vijay, She blogs at Shoba's Delight . Do visit her space for delicious veg and non veg recipes. The two secret ingredients she gave me for this month's theme "Monsoon Treats" were Corn and Green Peas. 1. Boil the potato, peel and cut into small pieces. 2. Boil the green peas and corn kernels with little salt. Drain and set aside. 3. Chop the onion, coriander leaves finely. 4. Remove the seeds form the tomato and cut into small pieces. 5. Heat a tbsp of oil and add the potato, green peas and corn. 6. Mix the salt and cumin powder. Tip in the onion and red chilli powder. 7. Stir well to mix and switch off the gas. Now add the tomato pieces and coriander leaves. 8. Mix everything well, check the salt and keep the mixture aside until use. 9. Just before serving, cut each papad into 2 halves. Brush it with oil on both sides. 10. Microwave it for half a minute on each side. Immediately roll it into a conical shape. 11. Alternately you can do this on a tawa too. 12. You have to do a single piece at a time because the papad gets crispy very soon and you cannot fold it. 13. Now fill the cones with the stuffing and spoon a little of both chutneys on top before serving. You can sprinkle chaat masala if you like. Thanks for liking Amrita.. it is a must try snack ! Shobha, you've rolled the papads so well. I still have to learn how to do them well. 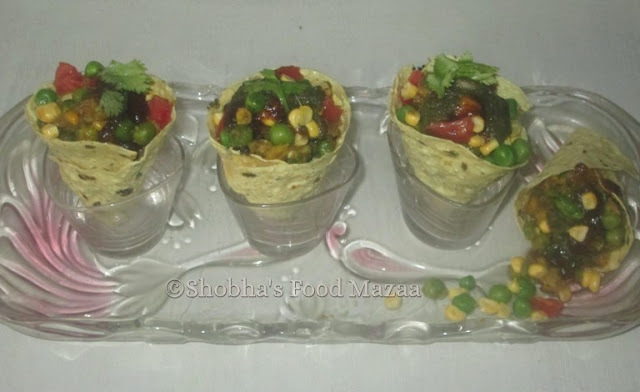 Lovely idea of serving stuffed papad as a snack. Papads and monsoon go hand in hand.